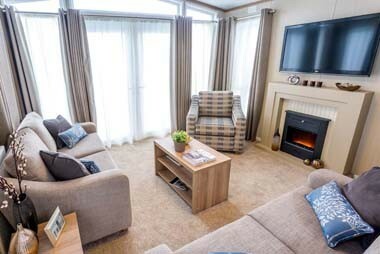 The Brompton from Pemberton Leisure Homes is one of their most popular mid-priced static caravans and for 2016 they’ve made a few changes to the layout at the front end, making the lounge seem even more spacious than it was in the earlier model. From the outside, the Brompton looks fairly standard in both styling and shape, but it’s the stunning interior that really wows. The exterior of the Pemberton Brompton demonstrates the usual rectangular box, with pitched pan tiled roof. It stands on a pre-galvanised twin axle chassis and is available in a range of cladding. 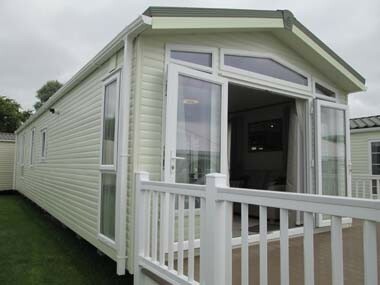 Pemberton offer four different types providing a great choice for the customer, ranging from vinyl and aluminium to timber and Canexel. Various colours can be specified to suit both taste and location. Insulation in the walls and under the floor is 60mm of fibreglass with the roof boasting 150mm. There are uPVC gutters and drain pipes and the flooring uses moisture-resistant boards (always a good thing to prevent water ingress) and all exposed pipework is fully lagged. All windows and doors are uPVC double-glazed and there’s an option of having side patio doors instead of windows and, at the front, French or patio doors in lieu of windows. This is a good option, as many people will want access to their patio deck from the front of the lounge. 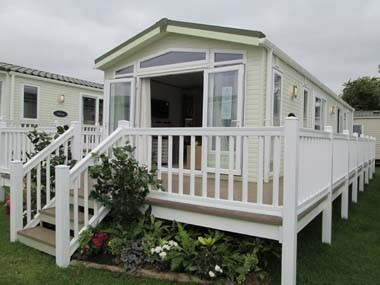 Pemberton can also offer a range of decks in a variety of colours and styles, along with exterior lighting if needed. Stepping through the front patio doors from the deck you are immediately impressed with one of the central features of the Brompton – a striking oak effect beam that suggests a separation between the lounge and kitchen/dining area. In reality this is a splendid open plan space, but the beam (giving hints of a barn conversion) really does look both attractive and practical. To the left is a floor to ceiling set of shelves that could be used as either a bookcase or ornament display. Plenty of seating in the form of free standing sofas (one of these is a pull out sofa bed) are placed around the room and a feature striped ‘accent’ armchair looks the part. A stylish, contemporary fireplace surrounds an electric flame effect fire with a flat screen TV over the mantle. On the opposite wall, a large mirror is installed behind the sofa. The lounge is fully carpeted and has coordinating blinds, curtains and scatter cushions in shades of brown which offset the light beige carpet and upholstery. The quality of the furnishings is first class and these sofas will last for a good many years. Other items of freestanding furniture included in the specification include a coffee table, ottoman and two side tables. The whole impression of the lounge is of a comfortable, cosy space designed for maximum relaxation. Pemberton have given special attention to the style and quality of the furnishings and the colour scheme is neutral, with the emphasis on subtle design and surface texture. Moving through, to your left is the dining area with a splendid glass topped table and four upholstered dining chairs. Extra chairs can be ordered if needed and, although the table is next to the kitchen and is ideal for serving up food, it’s not cramped with plenty of room to move. Opposite the dining area is a large sliding patio door giving access to the deck at the side of the home. The kitchen itself is a lovely, large L-shape with a colour scheme in shades of brown that gives a continuity of style to the whole home. Designed to a high specification, there are plenty of storage cupboards below and above the wide, 900mm counter tops. 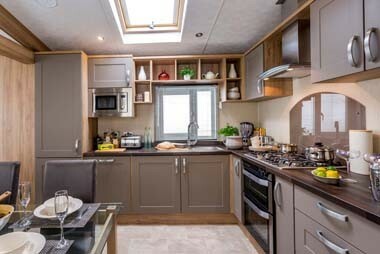 Appliances included in the Brompton as standard include an inset 5-burner gas hob with electric ignition, an externally vented cooker extractor hood, a gas oven and grill with electric ignition, and a microwave oven. There is also a large integrated fridge/freezer set behind the tall cupboard facing, on the left hand side of the stainless steel sink, with high arched mixer tap. Optional accessories include a dish washer, washing machine and tumble dryer. One nice, practical touch in the kitchen is the skylight which has been fitted in a central position and allows natural light to flood in. Downlighters set into the vaulted ceiling also provide illumination when needed. In our opinion this kitchen is a really stunning space, both practical for the preparation of food as well as great to look at and socialise! Unusually for this type of home, the access door leading to the bedrooms and bathroom is to the right, on one side of the wall, rather than centrally positioned. This allows more space to be given to the kitchen. Through it, you enter the main corridor, off which are two bedrooms and bathroom. To your left, the twin bedroom features fairly wide beds set either side of a central cupboard and shelf unit. A window with Venetian blinds lets in light from the outside and a central ceiling pendant – a sort of cross between a shade and a chandelier – really brightens the room. On the Brompton all bedding, throws, scatter cushions, duvet covers and pillowcases are included, as is a TV point and power socket. Bedding is cream with an accent red for throws and cushions. 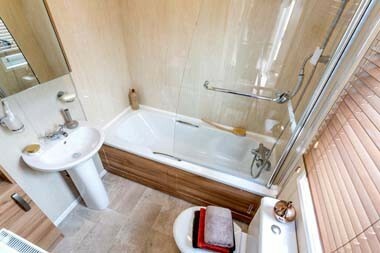 At the end of the corridor is the main family bathroom with full size bath and hand shower with protective glass screen, a pedestal hand basin with mirrored cabinet over and double flush toilet. You are able to specify a shower cubicle instead of a bath if you want. Walls and floor are all wipe clean and there is a small storage cupboard for towels to the left of the hand basin. Altogether a nice, simple bathroom with everything you need. 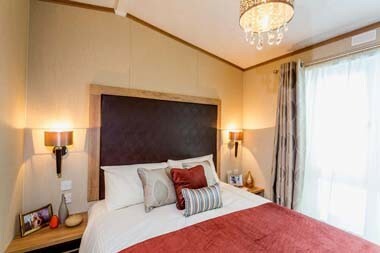 Opposite, a final door takes you into the master bedroom with its central double bed and big, brown, padded headboard. Side tables and shelves are either side of the bed and there are twin wall lights, switches and a power socket on both sides. A similar lamp pendant to that in the twin room is also included, as is a large floor to ceiling window. A roomy double wardrobe completes the scene. Just to the left of the wardrobe, a door leads to a very nicely appointed en-suite. 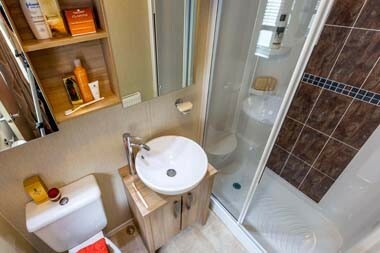 This has a walk in shower with sliding glass door, circular ceramic basin set into the top of a wooden cupboard unit and a toilet. Storage shelves and a mirrored cabinet are fixed to the walls with plenty of space for your usual bathroom toiletries. A word on heating – the Pemberton Brompton has a gas combi central heating system with thermostatic radiator valves fitted to every radiator and these are positioned at various points around the home. You are able to specify an electric system instead if that is preferred. Pemberton’s Brompton is a real eye-opener. We were very impressed on our review visit, especially the superb oak beam, the neutral colour scheme and the obvious thought that has gone into both the design and choice of quality fixtures and fittings. 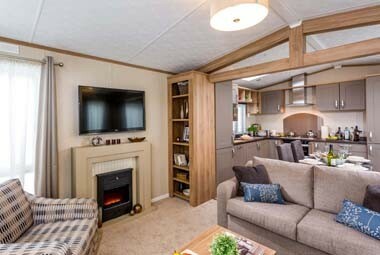 This home – it’s almost mean to call it a caravan – would appeal to those wanting style and comfort but with a dash of the traditional thrown in. Oak beam between lounge and kitchen. Excellent choice of colour and style in fabrics and surfaces. None we could thing of! The new layout offers a spacious home-from-home, bringing style and comfort where and when it’s needed most – when you’re on holiday! Build Standard: BS3632 Residential Standard (review model). 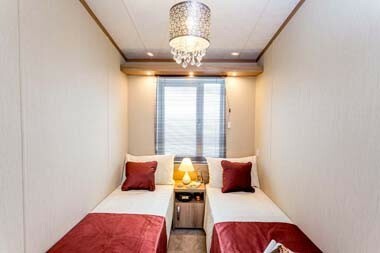 Berths: 4, in two bedrooms (one twin and one double), plus there’s a sofa bed in lounge. Key Optional Extras: Windows instead of French doors (not on Residential Spec. ); electric heating as an alternative to gas; integrated dishwasher and washer/dryer; range of claddings: timber, vinyl, aluminium and Canexel; shower instead of a bath; alternative sized beds. *Additional charges will be made by park operators, and/or distributors for transport, siting and annual maintenance. Please check the price carefully before you commit to purchase, as prices vary considerably dependent, amongst other factors, on the geographical location of your chosen park.